People sometimes wonder why the Orphan Care Initiative is so centered on working through the local church. Our Initiative is part of the PEACE Plan, Saddleback Church’s model of mobilizing ordinary believers to tackle the “global giants” – the issues affecting billions around the globe. In this article (originally posted to Pastors.com), Pastor Rick Warren describes some characteristics that make the PEACE Plan unique and sustainable. It’s basically what Jesus did when he was here on earth. There’s not a lot that’s unique about doing these five things. Mission organizations in all corners of the globe are doing them already. Churches have done them for 2,000 years. First and foremost The PEACE Plan is about reclaiming the primacy of the local church in its role in global missions. Why? For the last century, the church has abdicated that role to parachurch organizations, mission boards, and mission organizations. Don’t get me wrong. These organizations are doing great work, but they were never God’s Plan A. God always intended it to be done by the church. And as we have handed over the reins of global missions, we’ve excused 99 percent of our members from participating in the five things Jesus did while he was on earth. The idea was this – let the professionals do it. Let the professional doctors care for the sick. Let the professional preachers start churches. But there just aren’t enough professionals. We all need to be a part of God’s mission in the world if we’re going to see his work get done. That’s why The PEACE Plan is centered around the local church. The PEACE Plan is modeled after the actual instructions Jesus gave when he sent out his disciples in Matthew 10 and Luke 10. You’d think that Jesus’ instructions would have long been the cornerstone of missions strategy for the church. Unfortunately, they haven’t. For example, Jesus says, “Don’t take a purse with you.” There are two reasons for that. First, he doesn’t want us to depend upon our money. He wants us to depend upon him. He is also saying that money can’t solve the problems of the world. You can’t solve poverty by throwing money at it. When you throw money at problems, you create dependency. You create a “what-have-you-done-for-me-lately attitude.” Jesus says, you’ve got to train people to help themselves. That’s a core part of The PEACE Plan. For another example, Jesus said: “Eat whatever they put in front of you.” He’s telling the disciples to adopt the local customs. You don’t ask those you are trying to reach to become like you before they become a Christian. You adapt your situation to them. They don’t adapt their situation to yours. Jesus tells the disciples to go out in pairs. The PEACE Plan is done by small groups. We never send people out alone. You look all the way through Jesus’ ministry, he never sends people out by themselves. He always sends them out in groups of at least two. That’s why we send out small groups through The PEACE Plan. Jesus also tells the disciples to find a “man of peace” in every village – to start with someone who is open to the message and influential. We teach our teams to spot a person like that on every trip and start with that person. Just take a look at the other commands Jesus made in those passages. Those words are the cornerstone of how we do PEACE. When I first started telling people about The PEACE Plan, I got a lot of funny looks when I mentioned my commitment to using amateurs. People thought it was the craziest idea they’d ever heard. How do you solve these five crushing worldwide problems with amateurs? I love the word amateur. It comes from the Latin word amore, which means love. Amateur literally means “out of love.” That’s what amateurs are. People who do what they do out of love. There simply aren’t enough professional doctors to heal all the diseases. There aren’t enough preachers to start all of the churches. Whenever I speak at economic forums, I always hear about the need to link governments and businesses together to help solve some of the world’s problems. But if governments and businesses could solve the world’s problems on their own, they would have done it by now. We need a three-legged stool. A one-legged stool and a two-legged stool will fall over. But a three-legged stool will stand. The third leg is the church. There is a role for governments. The Bible tells us that. They bring order and execute justice, along with other responsibilities. There’s also a role for business. Businesses bring management skills and capital, for example. But you can’t forget the church either. We have a crucial role to play. There are things the church brings to the table that neither business nor government can. PEACE is a comprehensive strategy. Why? The five global evils we’re fighting are intertwined. Poverty is often related to disease. Corruption (bad leadership) is often related to education problems. They are interconnected. Other groups can attack just part of the problem. The church is called to deal with all of the problems. We can’t shirk our responsibility. We have something we didn’t have a generation ago – the Internet. It allows us to talk to one another even though we are in different parts of the world. Every time God’s Word has been put in a new technology, revival has come. When Gutenberg developed the printing press, we had the Reformation. Why? The Word could get around faster. Through the Internet we have a great opportunity to spread the Word even faster. The Internet has allowed us to network churches all around the world to solve these problems. In the past, if two churches from different parts of the world were working in an area, they couldn’t share information. Often, they wouldn’t even know the other was working there. Now they can communicate. This means that PEACE doesn’t depend on fundraisers, bake sales, or garage sales. It creates self-generating and self-sustaining projects. It fosters sufficiency, not subsidy; a hand up, not a hand out. We’re going to reinvent how missions work is funded. Did you know that a $50 gift can change a person’s life in most places in the world? Buy a chicken and you have an egg factory. Buy a goat and you have a milk factory. It’s amazing how a little money will make a big difference in a person’s life if it’s done in a way that can be sustained. If you would like to be a part of what the PEACE Plan is doing to equip ordinary believers in local churches to end the orphan crisis, email us at orphans@saddleback.com or call the Orphan Care Initiative line at 949-609-8555. The next day, 50 ordinary Rwandan believers came from various churches to receive the training! It was incredible that 50 individuals from different churches would drop their daily work to come receive training on how to support adoptive families in their communities. This answered prayer only illuminates the bigger miracle God has been stirring across Rwanda. Orphans are being taken into families with immediacy, churches are being mobilized to support families, and local church members are the ministers! 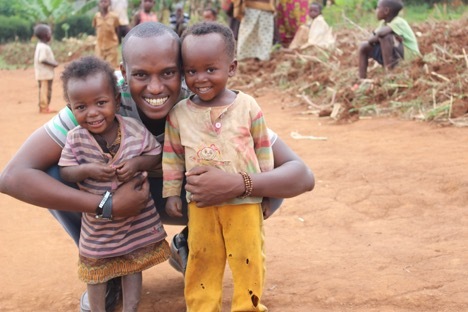 If you would like to be part of a miracle by sponsoring a Rwandan family to help them adopt, visit Saddleback.com/Sponsorship, or email orphans@saddleback.com for more information. Why does sponsorship support the whole family? Families end the orphan crisis. We can be a voice for the voiceless and we have been granted the freedom to do so. We can be advocates for children being adopted into permanent and loving families! How can you be an advocate for adoption? Write your congressperson! To find your representative go to http://www.house.gov/representatives/find/ and enter your zip code in the “Find Your Representative” on the top of the page. Once you locate your congressperson, there is a list under the “Representatives” tab of all the names and you can find your congressperson’s contact information and website. On the website you have the option of emailing a message or they will list an address (DC office and district office). A hard copy always makes a statement, but if time is limited, email is always a great option. Write an email or send a letter! Address the letter correctly and always include the title of your representative (ex. “Dear Representative _____”). In the first paragraph state who you are and why you are writing. The second paragraph should include specific examples and/or statistics, as well as stating what the bill will do. The third paragraph should state why the bill is necessary and should thank your congressperson for their consideration. Close the letter with your name and information. The best letters are courteous and concise; try to keep it to one page. Make sure your facts are right! Do not demand anything from them, simply urge them to support the bill. Feel free to add something personal that could display empathy. Below is a link to a template for you to follow. If you write a letter, make sure to find your congressperson’s information and to personalize the body of the letter. Your opinions matter to our government and these letters will make a difference. If you could take half an hour out of your day to send a letter, you could be impacting the lives of millions of children. You can be an advocate for adoption, a voice for the voiceless, and a defender for the orphan. If you would like more information on how the Orphan Care Initiative works to help children remain in family, reunite with family, or regain family through adoption, email orphans@saddleback.com or call the Orphan Care line at 949-609-8555.